00:30:00 Makes 4 servings, 1/4 recipe (314 g) each. Makes 4 servings, 1/4 recipe (314 g) each. Crispy baked chicken with stuffing and vegetable sides - this 4-ingredient dinner is on the table in 30 minutes. Coat chicken with coating mix as directed on package. Place in 15x10x1-inch pan lined with foil. Discard any remaining coating mix. Bake 20 min. or until chicken is done (170°F). Meanwhile, prepare Stuffing and cook vegetables. Serve chicken with Stuffing and vegetables. Coat chicken the night before. Refrigerate until ready to bake. Substitute your favourite vegetable for the peas and carrots. 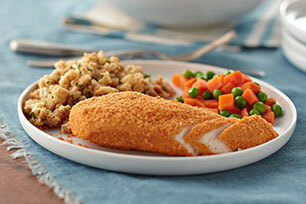 Hot & Spicy Crispy Chicken: Prepare chicken as directed using Shake 'N Bake Hot & Spicy Coating Mix. Crispy Parmesan Chicken: Prepare chicken as directed, adding 1/4 cup Kraft 100% Parmesan Grated Cheese to the coating mix. Serving Size Makes 4 servings, 1/4 recipe (314 g) each.